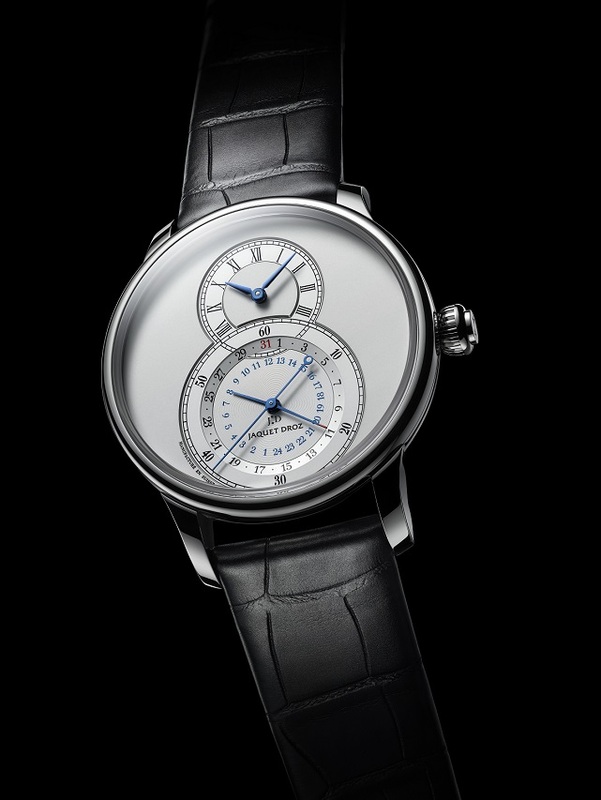 Jaquet-Droz Grande Seconde Dual Time keeps cadence with history, resonating with the rhythm of the journeys made by Pierre Jaquet-Droz in the 18th century. Here is a timepiece that celebrates the magic in a two-beat tempo with a brand new mechanism and elegantly positioned second time zone. In 2016, for the very first time, the brand has used the concept to inspire one of its most emblematic models: the Grande Seconde. Rejoicing in all the possibilities time presents, this historic piece is endowed with two off-center dials, slightly overlapping to delineate a figure eight, the brand’s tutelary number and a symbol of balance and infinity. A new movement was developed to create an upper dial displaying the local time and a lower seconds dial, off-centered at six o’clock, that doubles up with an hours and minutes dial giving the reference time. All this is accomplished without compromising the elegance of the slender seconds hand that makes a complete rotation for every minute. Remaining true to the aesthetic principles of the brand, the Jaquet Droz artisans conceived a classic, sophisticated display, starting with contrasting yet complementary indexes: Roman numerals on the upper counter and Arabic numerals on the lower. They also added a further complication - the date - indicated by a red-tipped hand that exploits and enhances the recessed lower subdial in a delicate structuring of form highly characteristic of Jaquet Droz. Such a choice is equally reflective of a desire to achieve improved readability. At Jaquet Droz, aesthetic concern always goes hand in hand with convenience and technical excellence. This is why the Grande Seconde Dual Time is fitted with a silicon escapement with unrivaled chronometric performance and unaffected by magnetic fields. A timepiece conducive to nomadic reverie and faultlessly reliable, the Grande Seconde Dual Time comes in three 43 mm-diameter versions: an ivory Grand Feu enameled dial with a red gold case, and a silvery opaline or onyx dial with a stainless steel case. It is equipped with a 65-hour power reserve, securing its place as a modern-day classic for all those who appreciate Time in all its dimensions, both here and there, the better to seize the myriad opportunities offered by the present moment.